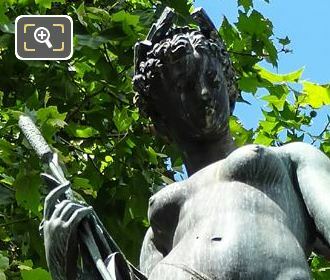 We were at the Place Andre Malraux in the 1st Arrondissement of Paris by the Comedie Francaise, when we took these high definition photos showing a statue called Nymphe Fluviale, which was sculpted by Mathurin Moreau for one of the Fontaines du Theatre-Francais. 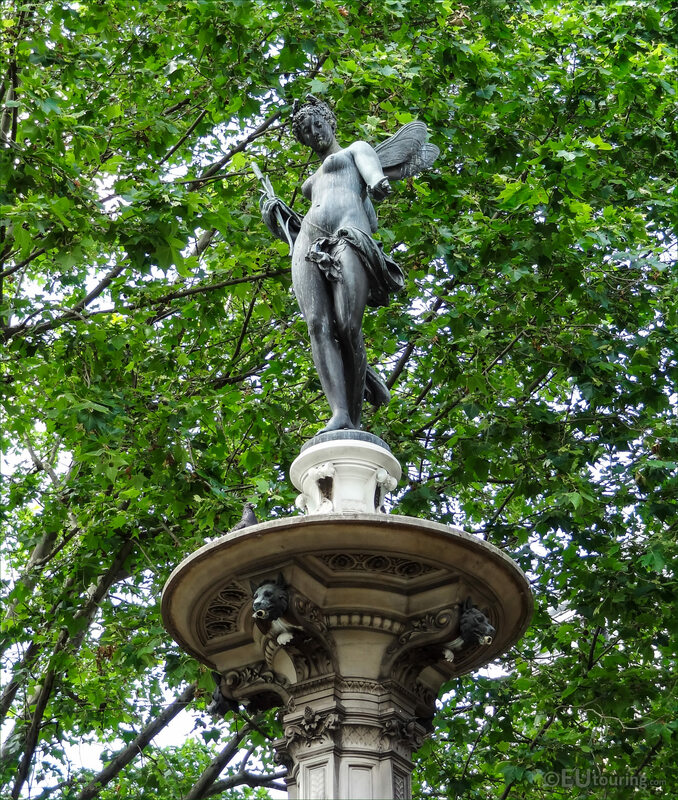 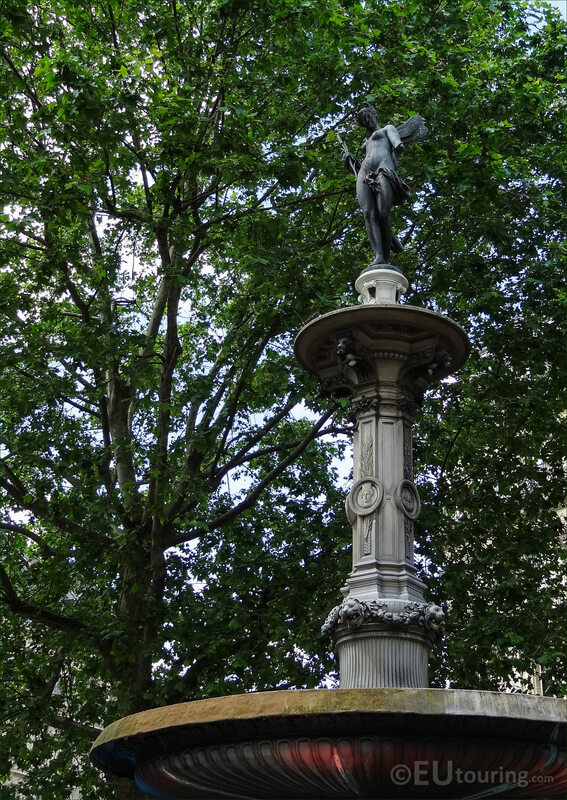 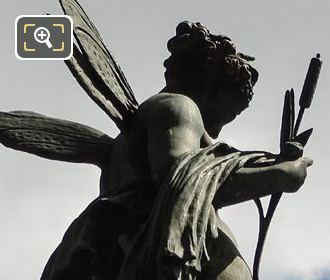 This first HD photo shows a statue called Nymphe Fluviale, which in English translates to River Nymph, and this is the top statue on one of the two fountains that were designed by Gabriel Davioud during the reorganising of Paris by Baron Haussmann, when many new buildings, squares and decorations were added to the city. Gabriel Davioud was born in Paris in 1824 and became the Inspector General for Architectural Works, along with having the title of Chief Architect for parks, gardens and public places in the city, and as a collegue of Baron Haussmann he designed numerous fountains, buildings, monuments, lamposts, ornate railings, signposts and much more. 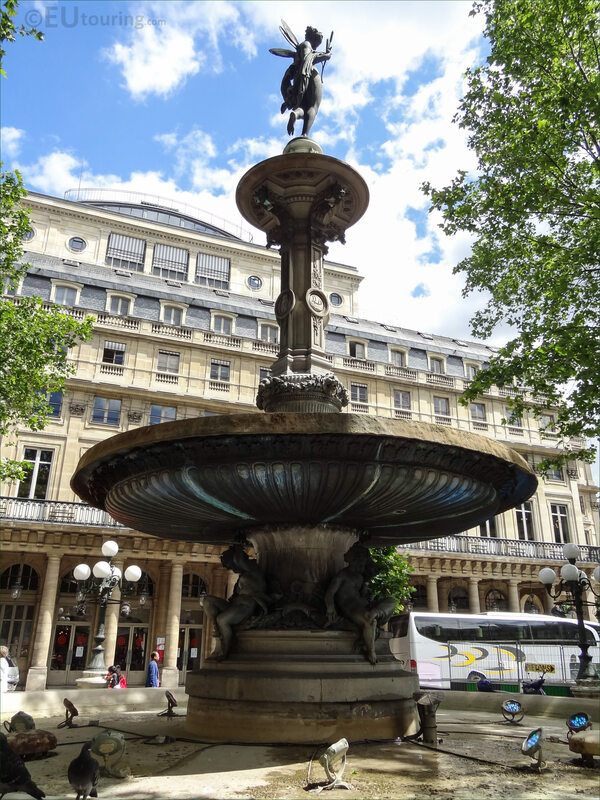 However, even though Gabriel Davioud designed the two fountains called the Fontaines du Theatre-Francais, he always commissioned different sculptors to create the ornate embellishments and statues, with this one called Nymphe Fluviale being produced by Mathurin Moreau. 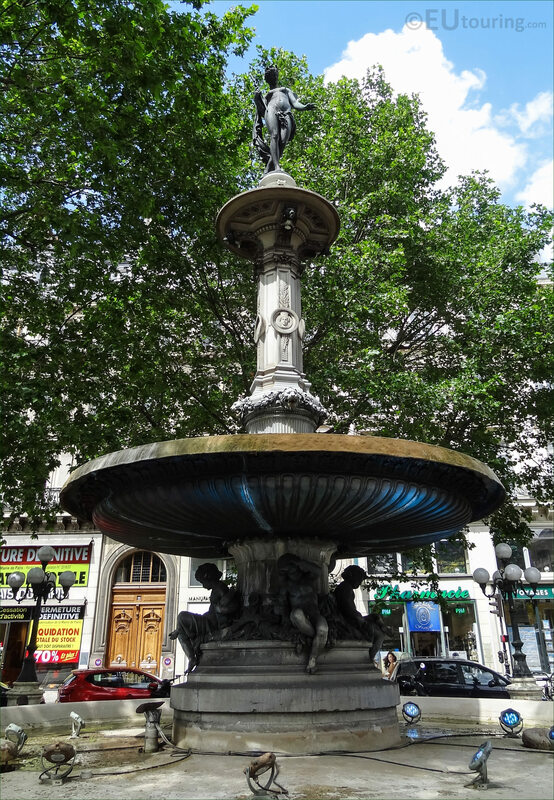 Yet the bottom section of the Nymphe Fluviale Fontaine du Theatre-Francais was produced by a completely different sculptor, and the same applies to the other fountain called Nymphe Marine, which also had two different sculptors, and this particular one is located between the Avenue de l'Opera and the Rue de Richelieu at the Place Andre Malraux. But getting back to Mathurin Moreau, he was the son of a sculptor born in Dijon in 1822 and following in his fathers footsteps he was admitted to the Ecole des Beaux Arts in Paris in 1841 where studied under Jules Ramey and Auguste Dumont, and after becoming recognised at the Salons for French artists, he started to receive many commissions including this one of the River Nymph. 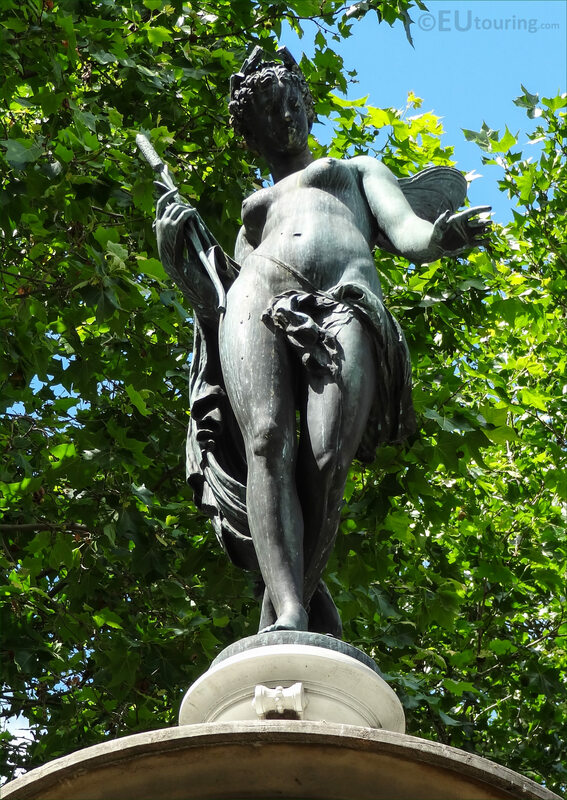 In fact, Mathurin Moreau had a prolific career winning several medals and awards including the Legion of Honour, and many of his works can be found all around France and throughout the world in places such as Peru, Buenos Aires, Geneva, Spain, etc,, however, there are also many statues and sculptures within Paris itself at tourist attractions such as The Louvre, Palais Garnier Opera House, Gare du Nord and the Musee d'Orsay. So here you can see a view of the entire fountain at the Place Andre-Malraux and the Comedie Francaise in the background, which has an alternative name of the French Theatre, so hence why these two fountains were named the Fontaines du Theatre-Francais. 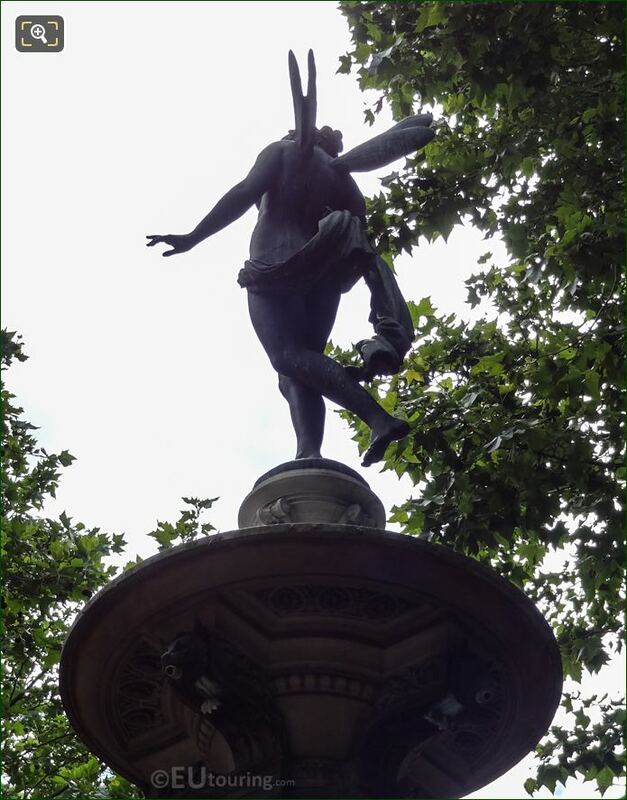 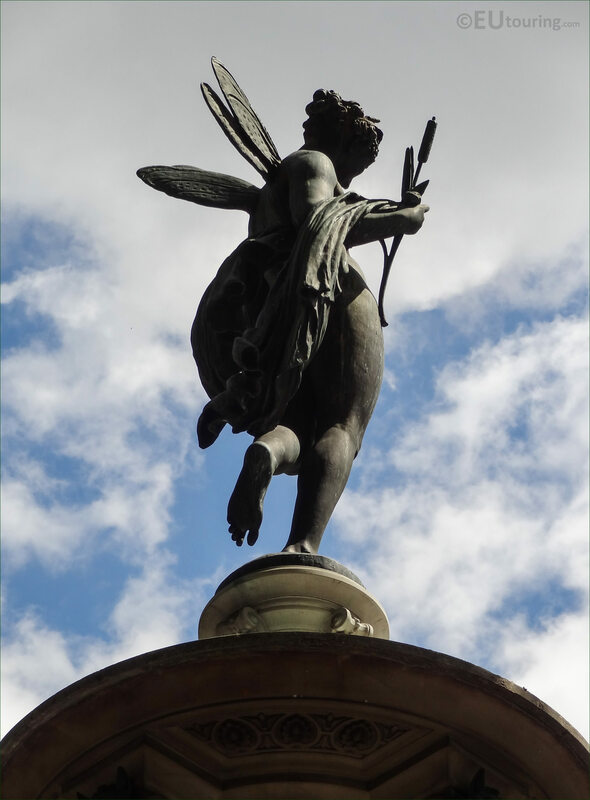 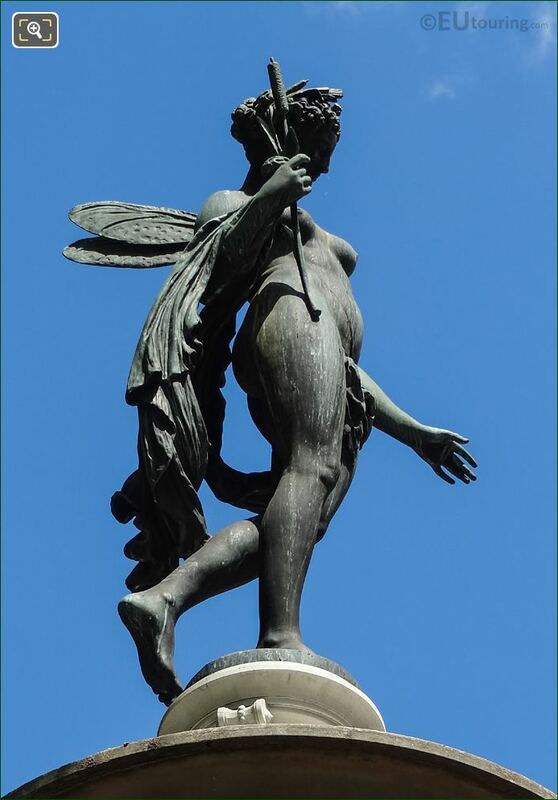 And here you can see the back view of the statue Nymphe Fluviale as an allegorical winged female figure depicting a River Nymph, which is located on the top of the Fountain of the French Theatre, which was executed at the same time as the Marine Nymph Fountain between the years of 1867 through to 1874, when they were fully completed.